Am I going alone or am I with somebody? Do I have any luggage with me? Do I actually need to go by car… Are there really no other options for me? The city of Antwerp is making lots of efforts to improve mobility: more biking lanes, better public transport connections, new tram lines, Park & Ride zones at the outskirts of the city, safer traffic, less air pollution. To realize all these plans, a lot of road works are ahead in the coming years, during which the city always takes the necessary measures so that traffic doesn’t get stuck too much and everybody can safely and timely reach their destination in and around the city. Check out www.slimnaarantwerpen.be. Car-free Sunday means open street day. All inhabitants and visitors of the city can take part in more than 15 different street activities. There are creative and sporty workshops, as well as some playful races… In short, it’s one big neighborhood party for and by the people of Antwerp. You really don’t wanna miss this! Don’t forget to pay a visit to the Mobility Market at the Meir, where you’ll get acquainted with a wide range of mobility options. You’ll also be able to test some city-friendly transportation vehicles on the test track over there. For those who like to ride their bike, there’s a bicycle tour that leads you from the city center to Antwerp’s greenest spots. It’ll take your breath away! You can check out all the activities on this map. 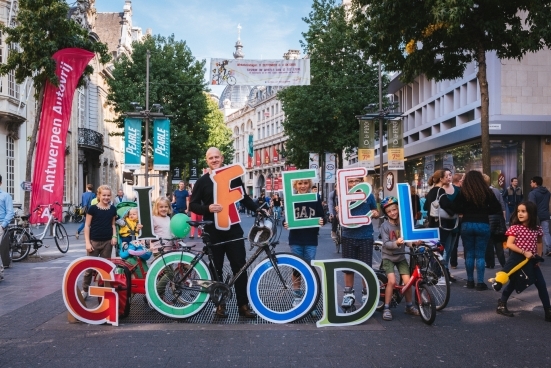 Come and enjoy car-free Sunday in Antwerp with your whole family!